A battle between hot and cold begins tonight in the western high plains and continues well into the Ohio Valley through Friday. Winter is trying to hold on as the heat and humidity of summer are trying to push the cold air back into the Arctic. Obviously, the warm air will eventually win, but tonight and tomorrow a blast winter will push all the way to the Gulf of Mexico. A severe weather outbreak will occur in the path of the clashing air masses. Now there are many more ingredients necessary to make severe weather like tornadoes. You can't make bread from flour and water....but it'll make a good base. Same here....temperature clash will make the base and a jet stream, a vorticity max, a low level jet, and lots of humidity will be the yeast, eggs, salt and oil. "INGREDIENTS ARE QUICKLY COMING INTO PLACE TO SUPPORT A SIGNIFICANT PERIOD OF SEVERE THUNDERSTORMS OVER PORTIONS OF THE SOUTHERN PLAINS. IN RESPONSE TO THE APPROACH OF THE DEEPENING COLD TROUGH OVER THE SWRN U.S...A STRENGTHENING LOW LEVEL JET IS RAPIDLY TRANSPORTING QUALITY GULF MOISTURE INTO TX AND OK. STALLED FRONTAL ZONE FROM SRN AR TO SWRN TX WILL RETURN NWD THIS AFTERNOON POSSIBLY TO RED RIVER VALLEY BY THIS EVENING. WITH DEWPOINTS RISING THRU THE 60S MLCAPES AOA 2500 J/KG COUPLED WITH STEEP MID LEVEL LAPSE RATES AND STRENGTHENING DEEP LAYER VEERING SHEAR PROFILES WILL BE SUPPORTIVE OF TORNADIC SUPERCELLS. LARGE SCALE ASCENT IS INCREASING WITH APPROACH OF DIFFLUENT UPPER JET. 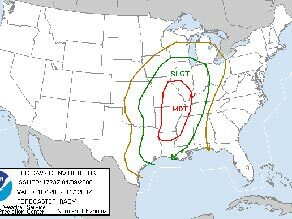 NEAR SURFACE BASED SEVERE THUNDERSTORMS EXPECTED TO DEVELOP BY MID/LATE AFTERNOON. STORMS THAT DEVELOP VICINITY OF THE WARM FRONT WILL QUICKLY BECOME SUPERCELLS GIVEN THE QUALITY OF THE AIR MASS AND STRONG DEEP VEERING SHEAR PROFILES. LARGE HAIL...AND TORNADOES ARE EXPECTED WITH STORMS THAT DEVELOP VICINITY WARM FRONT THIS AFTERNOON. THE POTENTIAL OF LONG LIVED SUPERCELLS AND STRONG TORNADOES WILL BE POSSIBLE AS STORMS TRACK ACROSS N TX INTO SRN OK THIS EVENING VICINITY SURFACE FRONTAL ZONE. SURFACE LOW DEVELOPS SWRN TX THIS AFTERNOON AND THEN DEEPENS NEWD INTO OK TONIGHT AS THE INTENSE TROUGH BECOMES NEGATIVELY TILTED AND MOVES INTO SRN HI PLAINS BY 12Z THU. SEVERE THUNDERSTORMS WILL REDEVELOP BACK IN TX PANHANDLE AND SWRN TX TO E OF DRY LINE/COLD FRONT OVERNIGHT. GIVEN THE STRENGTH OF FORCING...A SEVERE SQUALL LINE WITH ENHANCED WIND DAMAGE THREAT WILL BE MOST LIKELY MODE. HOWEVER EMBEDDED SUPERCELLS AND TORNADOES ARE ALSO LIKELY AS THE SHEAR AND INSTABILITY WILL STILL BE MORE THAN SUFFICIENT...EVEN WITH THE NORMALLY UNFAVORABLE TIME OF DAY. DURING THE AFTERNOON AND EVENING ADDITIONAL STRONG/SEVERE THUNDERSTORMS WILL DEVELOP VICINITY FRONTAL ZONE FURTHER E ACROSS AR/NRN LA. WHILE SHEAR WILL BE MARGINALLY FAVORABLE FOR ORGANIZED STORMS...MDT INSTABILITY WITH MLCAPES AROUND 2000 J/KG AND STEEP MID LEVEL LAPSE RATES WILL SUPPORT AT LEAST MULTICELLULAR STORMS WITH LARGE HAIL POTENTIAL." Wow, so what does all that mean? Let's go piece by piece. First Paragraph: Ingredients are coming together....you can have humidity, cold air, a jet stream, and all of the other parameters of severe weather, but if they are not in the right alignment, you will only get rain. In this case the "cold trough" (a dip in the jet stream) and the "Low Level Jet" (a strong wind from the south at 2000 feet) are working together. Second Paragraph: A stationary front across central Texas will move north tonight to the Red River. This move will bring humidity to the north...closer to the cold air coming in from the north. The rest of the paragraph refers to the profile of the atmosphere with respect to potential volatility of a developing storm. Third Paragraph: "Large scale ascent" means the air at the surface is rising to higher levels. Rising air makes clouds ...sinking air makes clear skies. "Diffluent upper jet" means the air at, let's say 30,000 ft., is diverging...moving apart...this movement apart causes lower pressure....lower pressure draws more air up from the surface...(remember rising air causes clouds...and in this case storms). "Storms that develop near the warm front will quickly become supercells" - The air mass by the warm front is warm and humid and the winds aloft change direction with height. This causes rotating thunderstorms that are not in a line with other storms and they are called supercells. A "dry line" is a dry air "front" that blows out of the high plains east of the Rocky Mountains. It pushes air up just like a cold front. Sixth paragraph: Other storms will develop over the Ark-La-Tex, but will not contain large tornadoes, but will contain hail. That's just for tonight and tomorrow morning. More tornadoes are likely Thursday and Friday. Oh man, thanks for the translation. Without it I might have planned a picnic. Wow. If only our local/regional weather stations would talk about the weather in technical terms and in translation like that...I might actually watch the local stations! Really, this is great. How come I don't see an author's name on this piece? My daughter has a meteorology report and presentation due on Friday, 10/31 and we wanted to add a Breaking News Bulletin about a tornado striking down during her forecast. Would you have any other narratives simular to this that would help her out?